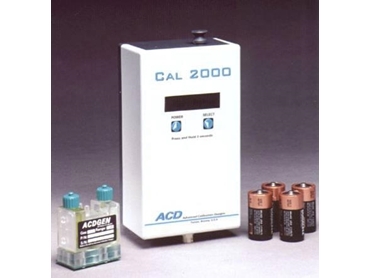 The Cal 2000 gas generators from ProDetec deliver powerfully versatile and accurate calibration solutions in corrosive gas applications. The electro-chemical generating cells are field replaceable and provide a calibration standard for the testing of gases such as chlorine, chlorine dioxide, hydrogen, hydrogen cyanide, and hydrogen sulfide gas sensors. The microprocessor controlled Cal 2000 gas generators feature an LCD display that shows field adjustable levels (ppm) and flow rates, whilst providing up to 50 times as much calibration gas as a disposable cylinder. They also feature a built-in mass flow sensor that automatically compensates for altitude and temperature. Combined with the instruments internal pump, this mass flow sensor delivers the flexibility required for calibrating both diffusion and sample draw detection systems.